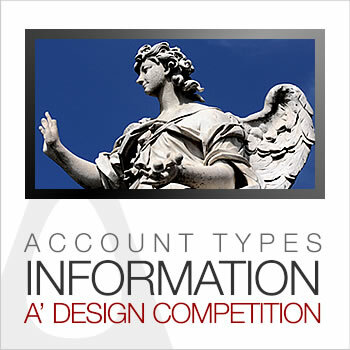 This page provides a list of all A' Design Award & Competition account types. In order to create positive discrimination between different competition participants, A’ Design Award & Competition has created several account types: Enterprise, Agency, Professional, Non-Profit, Academic, Young, Start Up, Media and Government. Each account type will show a distinct account-type label for the user profile and will grant inclusion to a further ranking system based on the account type in addition to special benefits designed for each profile to create further value; i.e. account types also effects the cost of participation meanwhile creating distinct opportunities and possibilities for different account types. Before you could nominate a design, an account type selection is necessary to determine the nomination fee and any other or additional services that could be granted and provided for your account. For more information regarding Enterprise, Agency, Professional, Non-Profit, Academic, Young, Start Up and Media account types, please refer to the information below. List of account types are given below. You will notice that each account has certain benefits as well as a different pricing for nomination fees. For all accounts, registration, submission and preliminary score is free of charge. Enterprise Account: Designed for the needs of enterprises in mind, this account type comes together with a complimentary PR push and Portfolio Evaluation Service. • Highest when compared to other account types. Eligibility / Conditions: Must be an enterprise, a commercial business that produces services or products in order to generate profits. The Enterprise generally buys (or generates in-house) design to implement to their own products or services. Includes also building development companies, as well as product manufacturers, factories, famous or national brands, service provider companies and any other company. Generates profits by selling products and services. Choose this option if you represent an enterprise. Eligibility / Conditions: A company that produces raw design as output to be used for other companies for their services and products. A design producer business whose core competency is design, architecture, creative consultancy, advertisement or similar. Does not produce any tangible products or services unrelated to design. Can be industrial design company, graphic design company, advertising agency, photography studio, marketing agency, creative agency or a PR Company. Generates profits by providing design & creative services. Choose this option if you represent an agency. Professional Account: Designed for Design Professionals, this account type also includes the complimentary PR Push and Portfolio Evaluation Service. Entry fees are discounted compared to Enterprise or Agency account. Eligibility / Conditions: A person that produces raw design as output to be used for other companies for their services and products. A freelancer whose core competency is design, architecture, creative consultancy, advertisement or similar. Could be an owner of a design company and could potentially be registered to chamber of commerce or a relevant association. Can be a designer, artists, photographer, architect, stylist or a creative. Generates income by providing design and creative services to others. Choose this option if you are a design professional or if you represent a design professional. Must be a single individual, cannot be group of designers or architects. Academic Account: Designed for Academics in mind, this account type allows scholars to join the competition with great discounts as well as provides opportunity for further involvement. • Least when compared to other account types. Eligibility / Conditions: Private or Public, regardless an institute of education where scientific method is followed to teach natural or social sciences, design, technology, architecture or any other disciplines or studies. The institution must be legally registered or accredited by the government. Universities as well as specialized or technical schools are eligible as long as it is a high institution teaching young adults. Choose this option if you represent an academic organization or if you are a staff of an academic institution (not for students of academic institutions). Young Account: Designed for upcoming talents and new designers, this account type provides significant discounts as well as complimentary participation options for young designers. Eligibility / Conditions: A young person, below or equal to 25 years of age, aspiring to become a good designer. Does not own a company or work for a company: does not yet earn money by providing design services. Can be a student or not, the field of study is not relevant for account type however is usually in one of creative disciplines such as architecture, interior design, product design, graphic design, communication design, interactive design, service design etc. Choose this option if you are a young design professional. Start-Up Account: Designed for newly established companies, this account type comes together with a complimentary PR push and Portfolio Evaluation Service as well as great discounts. Eligibility / Conditions: A newly established business within the last 3 years, already registered and having a tax number. Full of energy, passion and creativity but needs support for marketing, pr and publicity. The start-up can be an agency for design or a future enterprise, i.e. could be producer of design, or integrator of design; can make or sell design products or services or just the service of creating designs. Choose this option, if you represent a newly established business within the last 3 years. In addition to age restriction, turnover must be less than 360.000 Euro / year. Media Account: Designed for publications and information dissemination channels, this account type provides complimentary entry in return of featuring award winners. Media account also allows access to Pressroom. Eligibility / Conditions: Press or Media institutions, registered (for printed media) or not registered (e-zines, new media and online) publications covering and spotlighting articles on lifestyle, design, art, architecture or any other topic of interest, including but not limited to sector specific publications. Please kindly note that corporate publications (publications by companies to promote themselves) and religious publications require prior approval for this account type. Choose this option, if you represent a publication, if you are an editor or press member.